On the 12th of February 2019 DSI announced the launch of the 19th DSI Supersport Schools Volleyball Championship at a press conference held at the Olympic House. The number one footwear manufacturer in the country has come forward, with the support of the Sri Lanka Volleyball Federation and the School Volleyball Association of the Ministry of Education, to organize this tournament, which has a significant spot in the history book of Sri Lankan volleyball. Initiated by DSI in 1999 along with the Sri Lanka Volleyball Federation and the Ministry of Education, the purpose of the championship is to provide an opportunity as well as necessary support to rural and urban volleyball players as well as a platform of national standard for them to show off their skills and further build their careers in both the national and international arena. The initiation of the schools’ volleyball championship has contributed in the development of nearly 40 sports personalities. At the point of initiation, a total of 198 teams participated in the championship. This year the organizers expect the participation of over 5000 teams from across the island. The tournament will be held at both, district and national levels with the district matches taking place from the 27th of April to the 5th of May, and the national level matches from the 1st to the 7th of July. Final matches will be on the 27th and 28th of July. The age categories are as follows: Under 11 Boys/ Girls, Under 13 Boys/ Girls, Under 15 Boys/ Girls, Under 17 Boys/Girls and Under 19 Boys/Girls. The Under 11 Boys/Girls category were added for the first time last year. Applications for the tournament will be available by the 28th of February at respective schools and all DSI showrooms across the island. Completed applications should be submitted to the nearest DSI Showroom. Applications can also be posted to the Marketing Department at No.257, High level Road, Navinna, Maharagama. All applications must be submitted before the 29th of March 2019. “It is a significant occasion for us at DSI, as 2019 marks the 19th year of the DSI Supersport Schools Volleyball Championship. It is both a pleasure and privilege for DSI to sponsor this much-anticipated annual event, which serves as a platform of recognition for the talented young sportsman/women from schools all across the island. 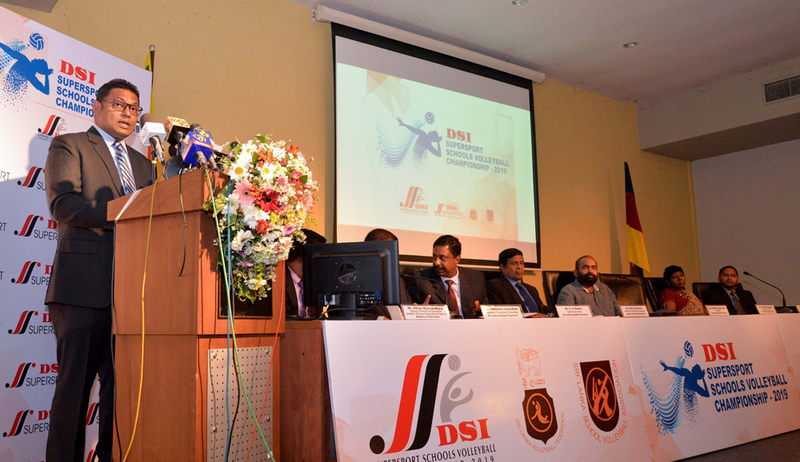 It is also our hope that the DSI Supersport Schools Volleyball Championship will play a crucial role in developing and popularizing Volleyball as the national sport of our country”, said Mr. Thusitha Rajapaksa, the Managing Director of D. Samson & Sons (Pvt) Ltd.